Guide to finding evidence-based health and medical information for your research. (Rosenberg, W. & Donald, A. (1995). 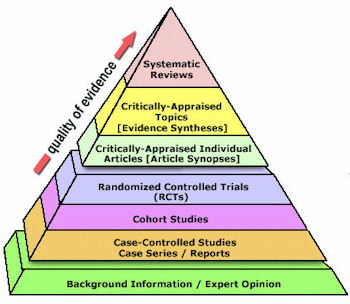 Evidence based medicine: An approach to clinical problem-solving. BMJ, 310, 1122-1126). Use PICOS to develop a clear idea what information you are seeking. P: For what group do you need information? I: What medical intervention do you need to study the effect of? C: What is the evidence that the intervention produces different results than another intervention or no intervention? O: What is the effect of the intervention? S: What is the research setting (e.g., ambulatory setting) or type of study (e.g., RCT)? T: Is there a timeframe for the outcome? This guide is maintained by Sigrid Brudie. JAMA Network video featuring leaders' perspectives on the past, present, and future of EBM.